Half a million South African children walk for more than an hour to school, which means every day they may be walking more than 12 km to school and back. The direct effects are tardiness, frequent absenteeism, exhaustion, lack of concentration and often the complete withdrawal from the education system. What can YOU do, you wonder? The simple solution is a bicycle! Bicycles change everything. Children arrive faster, safer and with enough time to concentrate on what’s truly important – their education and future. It is hard to comprehend what these children have to go through in their young lives. Providing them with a bicycle is the least we can do, don’t you think? I am an enthusiastic mountain biker and ride for Team BreakAway, a Cape Town based cycling team. Our team feels a strong responsibility to leave the world a better place than we found it, and want to use our passion for the sport as a platform to create awareness and support Qhubeka and World Bicycle Relief in their mission to mobilize children with bicycles. The cost of one bicycle includes: component manufacturing, shipping, duty, tax, assembly, delivery, helmets, field visits, field mechanic training, monitoring and evaluation. Our goal is to raise enough funds to supply 300 bicycles to one South African school in July 2016. Please join us in our efforts and make a donation today. World Bicycle Relief is a global non-profit organization dedicated to advancing education, health and economic opportunities by providing simple, sustainable transportation. Since World Bicycle Relief’s founding in 2005, it has delivered more than 220,000 specially designed, locally assembled bicycles to people in need. 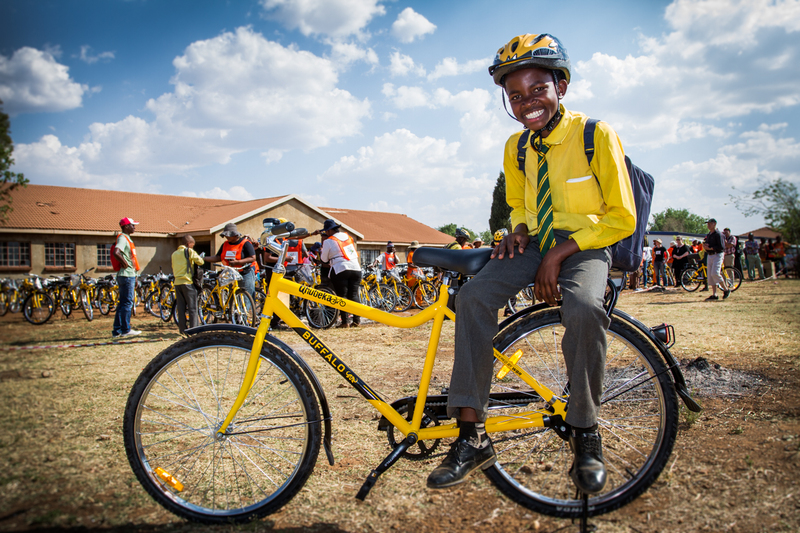 Qhubeka is the World Bicycle Relief’s program in South Africa helping to mobilize people through the Power of Bicycles. Put kids on Bicycles is an education empowerment initiative that distribute bicycles to students, teachers and education workers to improve access to education, reduce travel time and as results boost educational outcomes. Students earn bicycles through study-to-own contract. In the short term, bicycles reduce children’s exhaustion from walking to school and help them attend regularly. In the long term, bicycles will help children complete their education, preparing them for better jobs and reducing likelihood of poverty. Visit Qhubeka’s website for more information on this project.